Whether you have one gerbil or several, it can be quite disconcerting to learn that he gnaws endlessly on the bars of his cage. As with many rodents, gerbils need to chew to file down their teeth, which continue to grow over the course of their lives. Yet cage bars are not the ideal way to do this. By gnawing on the bars, there is great potential for the gerbil to develop mouth sores or broken teeth, which can make it difficult to chew food. Even worse, the chewing wears the bars thin over time, allowing the gerbil a way to escape. 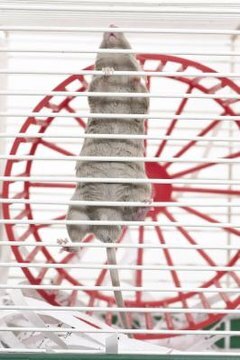 Your gerbil may be biting the bars of his cage for many reasons. He could be lonely or not have ample, safe chewing materials. If it is a small cage, the gerbil will likely chew to get out. Find a remedy for this behavior for the health and safety of your gerbil. A glass aquarium, or fish tank, with a screened lid is a great alternative. It has no bars for a gerbil to chew or kick bedding through, while still allowing fresh air in. Many 10- and 20-gallon tanks allow plenty of floor space for gerbils to run around. Place heavy, sturdy objects like books on the screened lid to prevent gerbils from escaping or other household pets from getting into the cage. It is imperative to frequently provide safe items for your gerbil to chew. Focus on wood and cardboard products. Many pet supply stores offer wooden sticks and chewing blocks. Cardboard is prevalent in many household items, including toilet paper rolls, empty tissue boxes and cereal boxes, and your gerbil will appreciate these items stacked in different ways. Gerbils will also chew paper towels to mix in with the bedding to create a nest. In addition to cage bars, there are other items you shouldn't allow your gerbil to chew. Plastic materials, often sold as huts in pet stores, can actually be harmful to the gerbil should he ingest a piece. Cedar and pine bedding are toxic to gerbils and the majority of human foods should be avoided. As gerbils age they do not chew as often so they need special care to prevent their teeth from growing out too long. A veterinarian is able to clip back overgrown teeth if needed.